The Coast Road | An odology of the California coast. If you see this guy cycling the coast, be nice. This is Marcus, 24 years old, a fellow Scorpio from Switzerland. 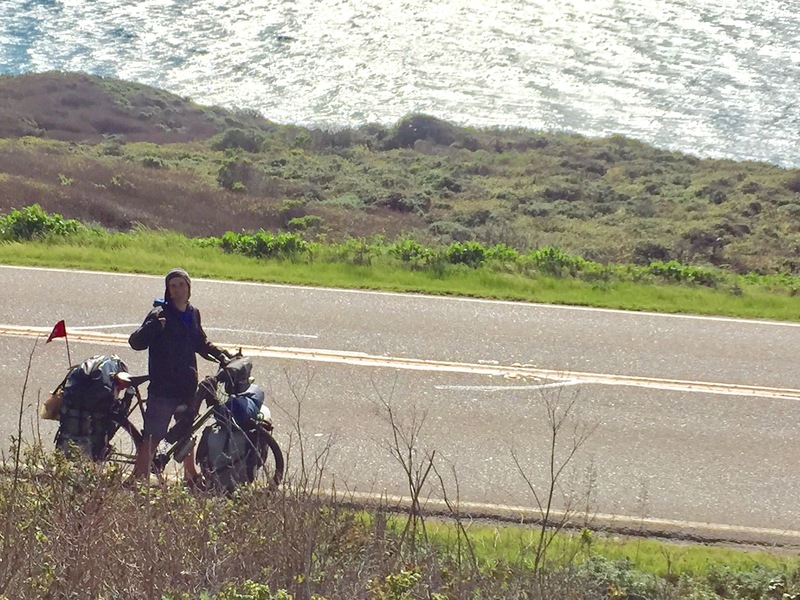 Marcus has rode that bike from Switzerland, through Africa, Argentina, and most recently from Las Vegas to San Diego and up the coast to where we found him yesterday. That’s a Swiss flag flying at the tail of his bike. We explained about Pfeiffer Canyon Bridge. And we explained that the bridge is guarded by CHP. Maybe he could do a 1 a.m. attempt to cross, maybe he could take an old dirt road down into the State Park and wade through mud and creek, but even there the Park Rangers will cite him if they see him. We asked if he wanted a beer, he declined. 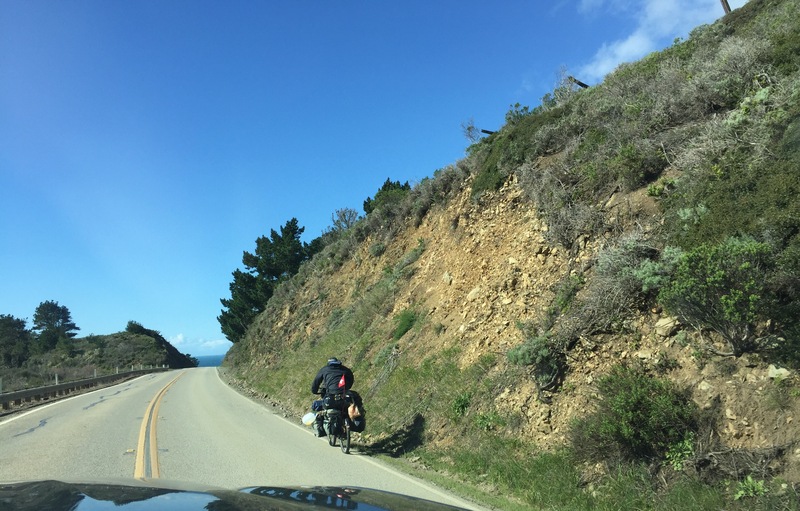 In the end, we told him to do what he wants, it’s his adventure, but we also described Nacimiento Ferguson Road, that it too is Closed, but perhaps he could use it as an outlet over to 101 then River Road to return to the coast. Being a mom, I also told him that it will be very cold tonight and that he should ensure that he camps somewhere warm. He assured me that he’s prepared. So be nice to Marcus if you see him. He’s courageous and has the enthusiasm of youth! You’re saturated with online political posts, memes, and tweets. Or you’re stuck inside because of rain and no swell. Or both. Now’s a good time to read a book. Jeff McElroy’s short stories, Californios and Californios 2 will occupy your mind, immersing you in waves of sketchy situations and native splendor. I’ve wanted to review this two-volume collection, Californios published in 2012 and Californios 2 in 2015, except I’ve been stymied by the author’s copyright instructions: “All rights reserved. No part of this book may be used or reproduced in any manner whatsoever including Internet usage, without written permission of the author.” No part. Whatsoever. Including Internet. As you’ve read in previous book reviews here on The Coast Road, I enjoy sharing passages from the books to get you fired up to buy and enjoy the read. I could write Jeff and ask permission for a few outtakes, but it’s not that important for this little blog. Out of respect for his copyright, I’ll not share Jeff’s writing, which I assure you, his writing is wonderful. I’ll tell you that his stories will remove you from this overcharged political world and fill your head with words such as Rincon, goofyfoot, right-handers, Sandspit, Humqaq, and you will share beers at Lee’s parking lot campfire out at Emma Wood, and, in another story, you will listen to Chumash history at Shimilaqsh. You’ll be so absorbed reading Californios, your mind will refresh and you’ll reconnect with your stoke. You must take my word for it, both Californios and Californios 2 are worth your purchase and reading time. Buy direct from Pierpont Press. Only $17.00 each. 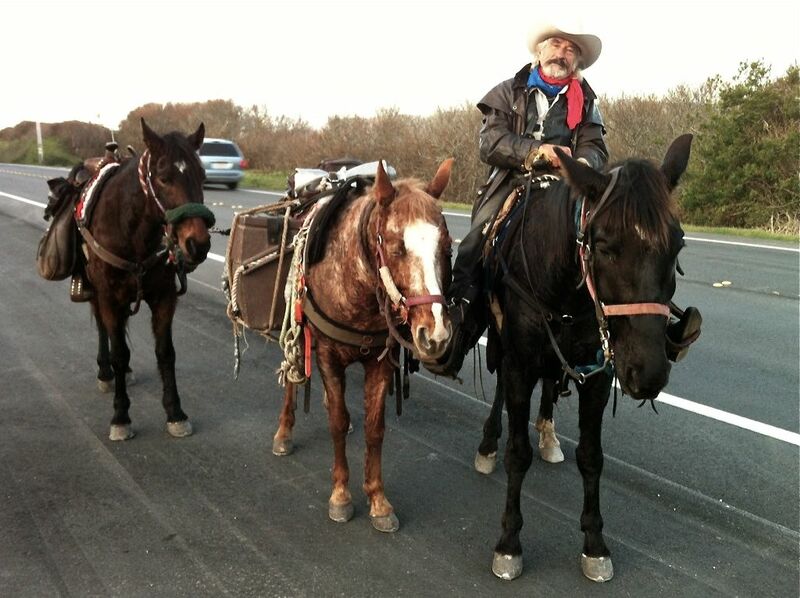 If you don’t want to mail check or cash, buy via Amazon: Californios and Californios 2. It’s been one month shy of two years since I posted a book review on this blog (not for want of California coastal books, of which there are many terrific titles released), because I was otherwise occupied and neglected this site. After reading Chris Chapman’s Stories of Arroyo Hondo, the end has arrived for this book review drought and I’ll post some favorite reads from the past two years, but first, Chris Chapman’s art and history book of a little canyon on the Gaviota Coast. As we know Arroyo Hondo today, it is a nature preserve managed by the Land Trust of Santa Barbara, located about 30 minutes north of Santa Barbara or about 10 miles south of the Gaviota Pass on U.S. Highway 101/California State Highway 1. Visitor access for hiking its short trails is limited to two weekends each month and the preserve rents for events of up to 100 people. Five streams form as the headwaters and converge and flow as Arroyo Hondo Creek under the highway and Southern Pacific’s trestle to the Pacific Ocean. You can jog down the stairs to the beach and walk the 6 miles of sandy beach from Arroyo Hondo to Gaviota at low tide. Stories of Arroyo Hondo begins as Tucumu (later, Tuxmu), a Chumash village recorded by Cabrillo during his contact with the Santa Barbara channel in late October through early November of 1542. Chris Chapman writes, “Radiocarbon dates from artifacts such as pestles and projectile points indicate initial occupation of 3,000 B.C.” In the 225 years from Cabrillo’s contact, Tuxmu was a vacant site by the time the Portola Expedition journeyed this coast. Arroyo Hondo was a section of José Francisco Ortega’s ranch, a grazing permit named Nuestra Señora del Refugio. Ortega enjoyed only three short years at La Nuestra. “He became obese and eventually could not mount his horse without help.” The Ortega family continued life on the rancho and one son petitioned for legal title from the Spanish, and then Mexican governments, but the family did not receive official title until 1866. Bit by bit the Ortega family sold portions of the rancho. “Arroyo Hondo was the last of the Refugio lands to remain in Ortega hands.” Stories of Arroyo Hondo displays black and white photos of the Ortega descendants, their adobe houses, a grist mill, and a schoolhouse. “In 1908 W.W. Hollister’s daughter Jennie Hollister Chamberlain Hale purchased the 782 acre Arroyo Hondo ranch” from E. Cordero, to whom the rancho was sold previously in 1889. “The Ortega family continued to live at Arroyo Hondo,” through both Cordero and Hollister-Chamberlain-Hale ownership. Transportation developments are covered in both text and black and white photos starting with stagecoach travel, then the effects of the railroad and herding of cattle by the Hollisters, and the automobile. “Vicente lamented that the cool ocean breeze could no longer drift up the canyon,” once the Arroyo Hondo Creek culvert and highway closed the canyon at the coast. and of course at Arroyo Hondo Preserve in the Ortega adobe. Retail is $19.95 plus tax. Shipping is possible if you cannot visit the above locations. Note: I do not personally know the author, nor do I receive any benefit from book sales. I think people should know about these California coast books and I’m happy to write about them. Almost four years ago I enthusiastically reviewed Elizabeth C. Ward’s Coast Highway 1 as “a fairly essential Coast Road Read,” and now Ms. Ward returns with another must-read for California coast enthusiasts or for anyone who enjoys a good mystery: Death in a California Landscape. The callers phoned Jake Martin, the same Jake Martin from Ms. Ward’s Coast Highway 1, returning as our noir narrator and unintentional private eye. Jake’s dear friend Millicent is found shot to death. Detective Swann suspects foul play, maybe even suspects Jake. Jake knows that Millicent, albeit in her eighties was full of life and not planning to die. Jake senses murder, but why and by who? Elizabeth C. Ward’s Coast Road Mystery, Death in a California Landscape, serves as a retreat from the holiday frenzy this December. Download to your Kindle or pick-up the book. Death in a California Landscape also makes for a fine gift. Happy Holidays! Click for Ms. Ward’s website. 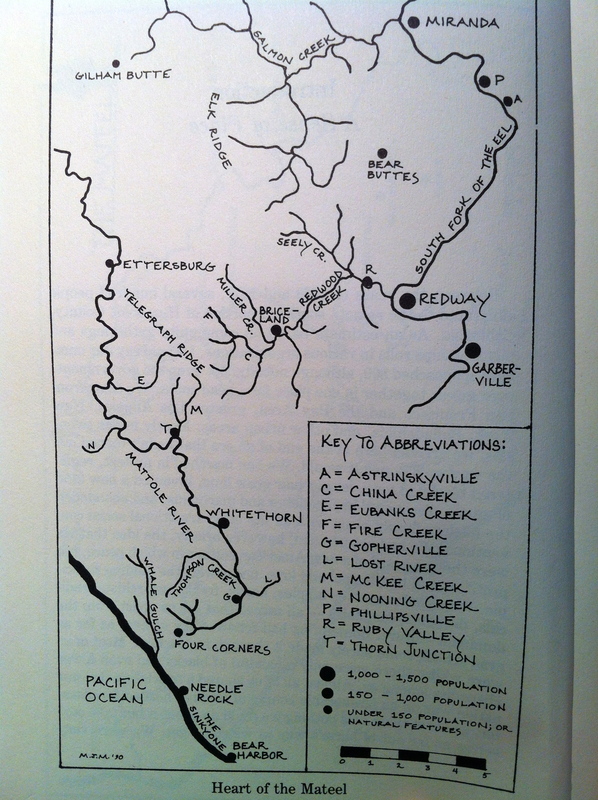 In my never-ending search for writings on the Coast Road, I discovered this little book that documents the people who moved to the Mattole and Eel watersheds, the “Mateel,” located in southern Humboldt County (SoHum). Twenty-three individual narratives intertwine to tell the stories of settlement, stereotyping of hippies, rednecks, loggers, straights, and the rowdy bikers, conservation and restoration of anadromous habitat, establishing Sinkyone Wilderness SP, and C.A.M.P. 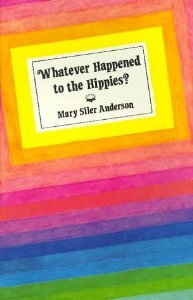 Whatever happened to the hippies is a question answered in Mary Siler Anderson’s book. The hippies created new communities and retained some American comforts; they both improved and damaged fish habitat: the conservationists versus the pot growers; and they continue to be active in the community as writers, watershed professionals, and caregivers. Many still have long hair.